No Man is an Island is a 5-channel “documentary polyptych”, a form artist/filmmaker Adam Sébire has been developing ever since an encounter with the van Eyck brothers’ Adoration of the Mystic Lamb (1432), perhaps the world’s most famous ‘painting with doors’ in Ghent, Belgium. The few polyptychs still in existence can no longer be opened or closed as intended, denying the form its unique kinaesthetic affect. This affect is vital: the work reveals itself via physical engagement, through a gesture of openness made by the visitor's arms. The wings perhaps constitute an Early Renaissance form of immersive interaction, and here they are updated for an era marked by the proliferation of digital screens. Only very recently have new, thin LED screens made such a work possible. The artwork takes as its theme the phenomenon of sea level rise, contrasting experiences on two ‘utopian’ isles (Venice & Maldives), and juxtaposing them with Norway’s rapidly retreating glaciers. Shots at meniscus-level create a sense of drowning while consistent horizons and parallel actions link geographically disparate locations. The ‘unseen’ nature of anthropogenic climate change poses particular challenges, both for a culture that emphasises ‘seeing is believing’ and for documentary forms traditionally reliant on visible evidence. The work explores crucial dislocations — of cause from effect, of today’s action from tomorrow’s result, of behaviour here from outcome there — through the spatialised form of a multi-panelled polyptych with which the visitor physically interacts. Fragment from the exhibition installation. Rather than displace its own carbon emissions to a coal-fired power station out of both sight & mind, the polyptych is powered by a fossil-fuelled generator (pictured left) outside the exhibition venue, challenging our habitual dislocation of responsibility, of action from consequence, every time we flick a power switch. 1. George Monbiot, "Paying for Our Sins," The Guardian, 18 October 2006..
First six minutes of the exhibition installation. Adam Sébire is a photographer & filmmaker with numerous broadcast credits to his name. 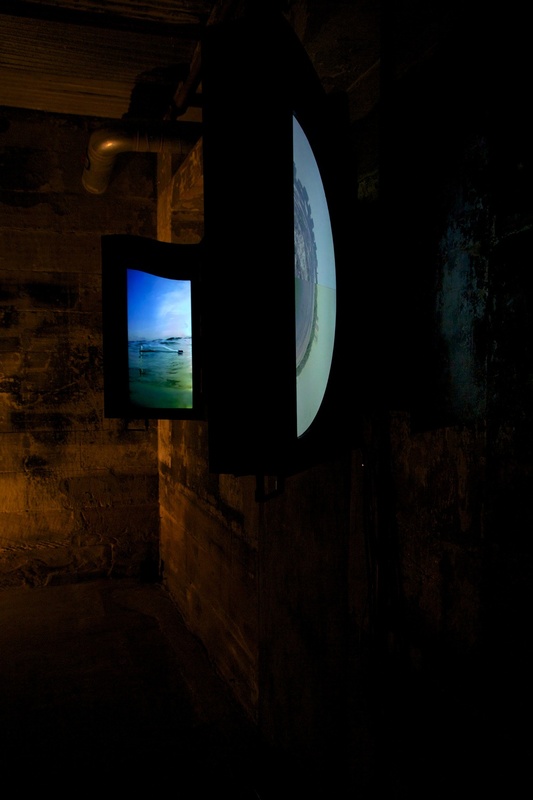 His artistic practise focuses on multi-screen documentary polyptychs to explore both sea level rise and the cognitive dissociations underlying climate change. His previous gallery exhibitions include Roads to Nowhere (2012, part of the Head On Photo Festival, Vivid Sydney and Rocks Pop-Up); and Raise | Retreat | Rise (2013, part of the Re:Cinema exhibition in Sydney & New York City and a collateral event of ISEA Sydney). Adam’s films include Echoes Across the Divide (2006) and Carried by the Wind (2008). Interview with the artist, 2'49". 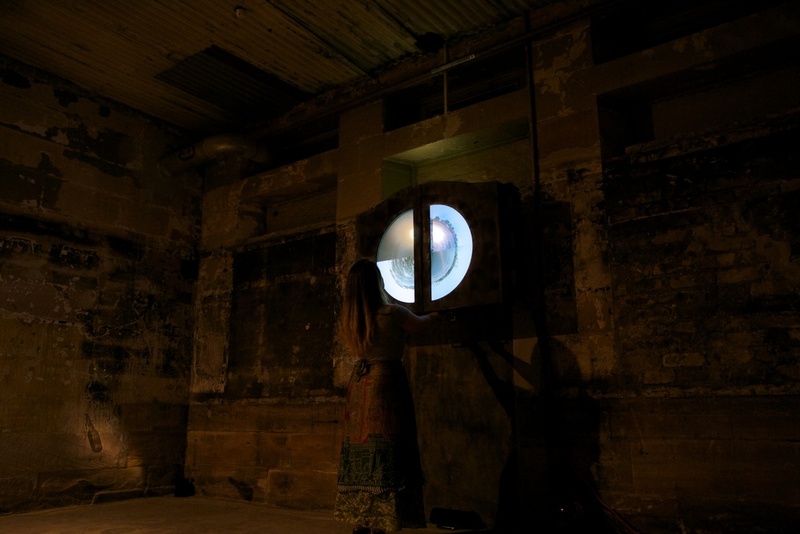 The Fauvette Loureiro Memorial Artists’ Exchange Scholarship, 2013. Link to Polyptych Nº1, Raise | Retreat | Rise.